I went for a professional baking workshop and discovered the joys and simplicity of baking – what a rewarding hobby to cultivate! 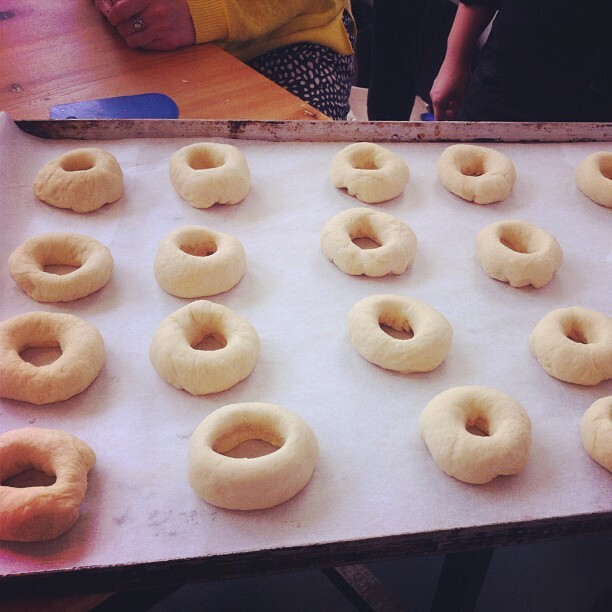 I always wondered how bagels are made because they have a very different texture than any other bread and finally all my doubts were cleared after attending this super awesome workshop at The Baking Lab, London. 1. Kneading – First and foremost, you will need to knead the dough obviously. So if you take one full cup of flour you need 1/4th cup of water and half a tea-spoon of oil and 1 teaspoon baking powder. Then keep kneading it till its not sticky and is stretchable. If it gets too sticky then all you need to do is leave it for 15 minutes and get back to it but do not add more flour, this is the mistake most of us make. 2. Shaping – Now you have your flour ready so the next step would be to shape it into a bagel (yay). Get chunks of balls from the dough and again knead it for some time (this is the part I enjoy most) and then with a sharp circular cutter just get rid of the center. After which you just keep playing with it and make the ring as smooth as possible. All done? 3. 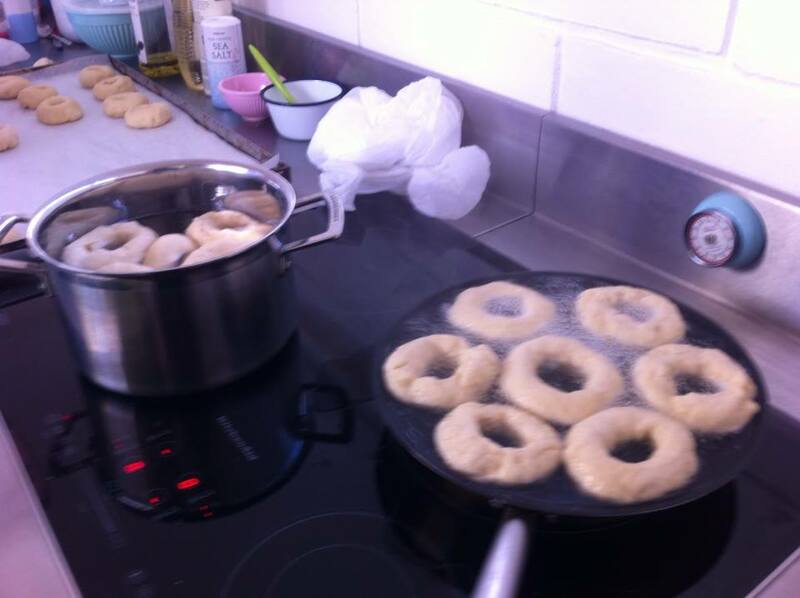 Boiling – Yes it sounds strange but this is what gives it the texture of a bagel, boil all of them in plain water for about 10 minutes. Then slowly take them out and keep them aside. 4. Coating– Glaze each one with raw eggs, use a brush for this almost feels like painting (haha). Then dip the glazed side in your favorite topping like poppy seeds or sesame seeds, you can use anything you feel like. 5. Baking – Finally put all of them in the oven and bake them for 15-20 minutes in 250 degrees temperature. In lay man’s terms bake it in medium heat so whatever oven you have just make sure its not in high temperature or low. 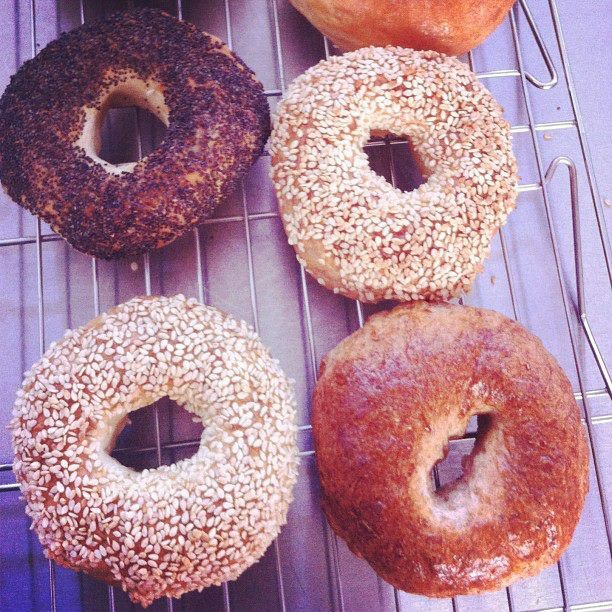 And your bagels are ready to eat! Woooohooo! The bagels look great and so fresh!